Incoming US President Donald Trump could use a UK trade deal to boost business for his Scottish golf resorts, former White House ethics experts have warned. Richard Painter, the White House chief ethics adviser to George W Bush, and Norman Eisen, former chief ethics adviser to the Obama administration, said there is a risk Trump may attempt to promote the interests of his private tourism ventures when talks start on a post-Brexit trade deal with the UK. Painter said Trump was “obviously very, very interested financially and emotionally” in his golf courses, which would “dramatically affect what the United States position is on trade,” according to the Guardian. “Our man has a dog in the hunt,” he said. Trump owns two golf courses in Scotland. He has spent more than £40 million ($50 million) building a new course and boutique hotel in Aberdeenshire and another £140 million ($173 million) acquiring and upgrading the Turnberry championship course and five-star hotel in Ayrshire. Both businesses are supported and promoted by Scotland’s official tourism and event agencies. 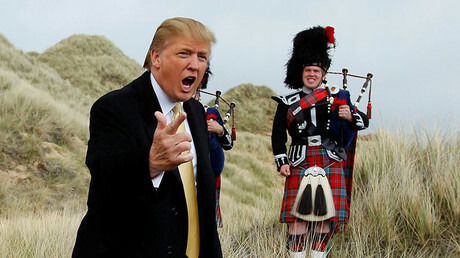 There has been long-running political conflict between Trump and the Scottish government over its staunch support for an offshore wind farm near his Aberdeenshire resort. Trump told the Times over the weekend that he planned to prioritize a new trade deal with the UK once Britain leaves the EU. He used the same interview to promote the Turnberry resort, saying it was “doing unbelievably” following the slump in the value of the pound since the UK’s decision to leave the EU. Trump’s Aberdeenshire course has consistently lost money, relying for its survival on loans from the Republican now totaling £40 million. The company said last week it planned to push ahead with expansions – building a second course and extending its hotel – despite Trump’s pledge last week to halt new and pending foreign investments by the Trump Organization. Eisen said Trump would be able to use “the full force of the United States government to attempt to extract concessions” that would benefit his Scottish businesses in future UK trade talks. If he did so, it would be a breach of the constitutional bar on US presidents using their office for personal gain – the so-called emoluments clause – according to Eisen. “It’s entirely possible … he will demand concessions as part of his trade negotiations – based on what we know about his style of doing business and his erroneous view that conflict laws don’t apply to him. 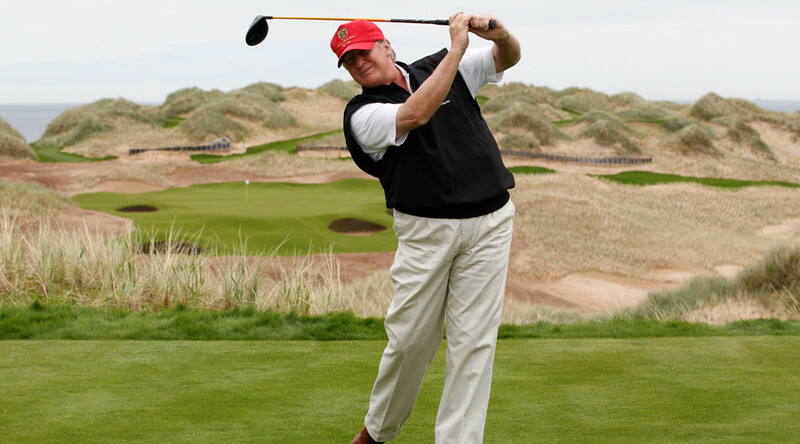 VisitScotland, the government-funded tourism agency, told the Guardian it promoted Trump’s golf courses and actively encouraged American visitors because golf is so significant to the tourism industry, generating £220 million for the economy. It is politically neutral, a spokesman said, but highlighted the resorts are premium attractions.